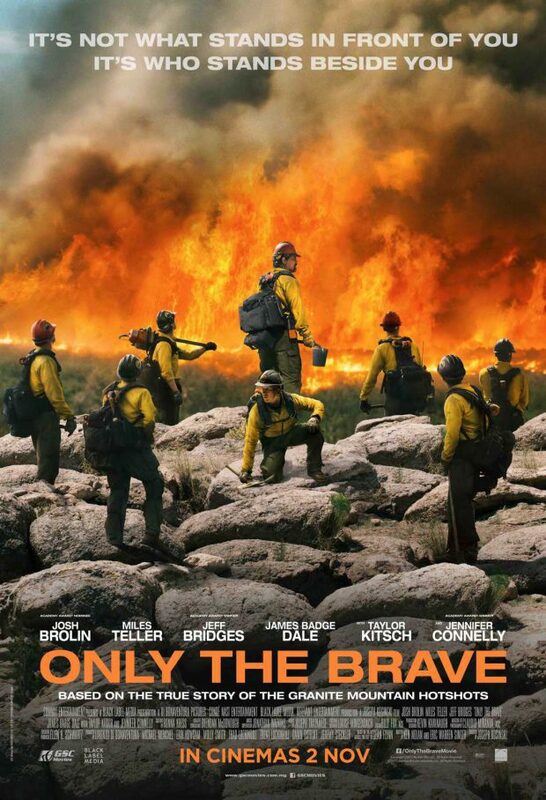 Joseph Kosinski’s Only the Brave tells the true life story of the Granite Mountain Hotshots; a group of firefighters working to protect towns from quickly spreading fires. The natural world is possibly the most frightening antagonist that can be used in any kind of media. Fire in particular is something that pretty much everyone can understand as being very dangerous so adapting a story about heroic firefighters fighting to fend off a massive blaze is very much a no brainer in terms of getting an audience on board. Using the elements as an antagonist also opens the film up to focus on the people tasked with dealing with the problem without having to focus on developing the antagonist. Everyone understands that fire is bad because it burns down homes and can kill people, nothing needs to be done to develop the threat level. This film boasts a large cast but manages to juggle them effectively though to varying degrees of effectiveness in terms of how those characters are handled. Josh Brolin is the centre piece of the film as Eric Marsh; the Superintendent of the crew of fire fighters responsible for calling the shots and keeping them all together. Brolin does a good job here as always but the character often feels like a collection of inspirational speeches rather than a fully defined person. There are exceptions to this such some conversations he has that come across as being very natural and the strained relationship he has with his wife Amanda (Jennifer Connelly) who grows to resent sharing him with his work. Most of the other characters don’t have significant arcs but are well developed enough for the audience to invest in them. Taylor Kitsch and James Badge Dale have some really good scenes and their interactions with other members of the cast are a lot of fun to watch. Taylor Kitsch in particular stands out as being memorable because he has a number of really punchy one liners. Miles Teller’s Brendan McDonough receives most of the focus here as the new recruit to the team. He’s the audience avatar for at least the first half of the movie and he has a clear arc to follow that starts with him being a drug addled screw up desperate to prove himself after becoming a father. His development surrounds him being more responsible and proving himself worthy of the respect of the others in the fire fighting crew as well as the mother of his child. All he wants is to be part of his daughter’s life and he’s clearly willing to put the work in. I’ve never been a fan of Miles Teller as an actor but he does a really good job here. He successfully performs the transition from screw up to responsible and comes across as someone worth rooting for throughout. This is definitely one of his better performances and he manages to not be overshadowed by the more talented members of the cast so it’s a very good showcase for what he can do. Despite being over 2 hours long this film rarely feels like it drags. There are some points where it lags here and there but overall it moves along at a decent clip. The story is broadly character driven as it should be with the threat playing a secondary role that comes into play at key points of the story. It’s an approach that works and keeps it from being labelled as simply another visually defined disaster movie. The omnipresent threat of the various fires is handled really well despite not directly affecting the area the characters are from. A lot of dialogue is devoted to making sure the audience understands what is at stake and how much danger everyone is in. This is enhanced by some really powerful visuals showing how unforgiving fire can be and how quickly blazes can spread beyond the capacity to be controlled. This creates some really tense and terrifying scenes showing people being overwhelmed by the natural world. This film suffers a little in the dialogue. Some of it is overly philosophical and laced with artificial meaning in an attempt to come across as deep. In most cases the dialogue accomplishes the opposite and comes across as fairly cringeworthy in places. Thankfully it isn’t as noticeable as it otherwise would be with it being delivered by a talented cast but there are some scenes that come across as laughably cheesy rather than dramatic. A well put together story that is driven by its characters rather than events. It juggles a large cast really effectively while focusing on a handful of them who interact with others who are well developed enough to get the point across. Miles Tellar’s Brendan takes the focus and allows Teller to deliver one of his more engaging performances as a man with a clear arc from screw-up to responsible that works really well. The film suffers from some hokey dialogue but the use of the fire as an omnipresent threat always on the horizon works really well and the film manages to appropriately tense when it needs to be.